Latecomers to the central valley of Mexico, arriving in the thirteenth century, the Aztecs soon conquered many of their neighbors and created a vast empire. Their capital, Tenochtitlán, now buried under Mexico City, supported over two hundred thousand inhabitants at the time of the Spanish Conquest in the early sixteenth century. The artistic achievements of the Aztec tribe range from imposing monolithic stone sculpture to delicate featherwork. This small statue is one of the many representations of fertility deities found in stone sculptures and painted codices. 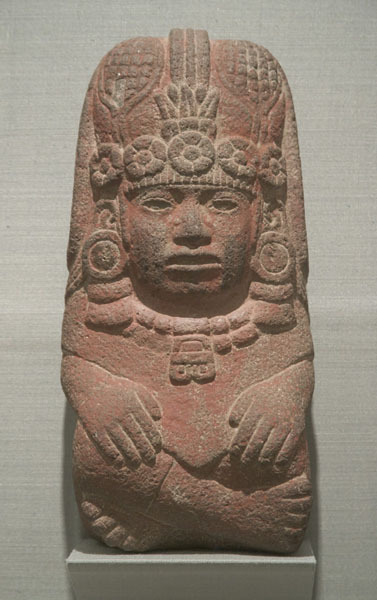 She is adorned with two ears of corn in her hair, symbols of the maize goddess; a five-blossom headband and a jade necklace, attributes of the water goddess; and, two signs of fertility: the double black stripes on her cheeks and a dusting of red pigment. Her pointed cape is unexpectedly plain.